I remember the first time I ever had a croquette. It was one of those moments when I asked someone what a croquette was after seeing it on a menu for the first time, they explained it and I simply knew I had to have one. I was in a riverfront restaurant in Queens, New York having dinner with friends and I felt like a right idiot for not knowing what this mysterious potato product was because everyone else was well familiar. It was one of those instances where the waiter brought a plate of two, I had one and gave the other to my date and then proceeded to order another plate of the delicious fried nuggets filled with mashed potatoes and cheese. 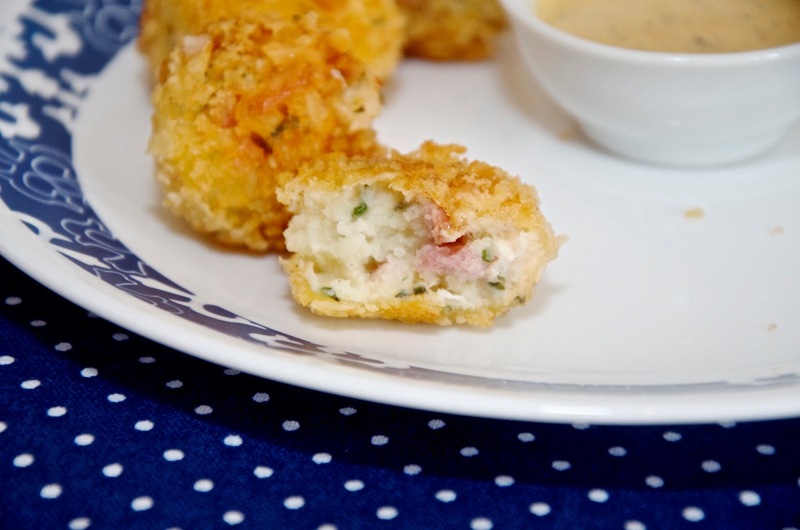 From that day on, I became a croquette girl - I love them and order them at restaurants whenever I see them on the menu! I'm particularly fond of chicken or ham croquettes from tapas restaurants or the 'nduja croquettes often found in Italian restaurants. For those of you who aren't familiar, 'nduja is like a spreadable pork sausage meat with a bit of spiciness that works just perfectly inside the fried shell of a croquette. Softer meats or meats that have been shredded or chopped finely lend themselves well to croquettes, however I'm just as in love with a plain old potato croquette which is basically not much more than breaded and fried mashed potatoes. Yum! This particular croquette recipe yields little round balls of goodness rather than the traditional cylindrical shape, mostly because it's easier to do yourself, but also because it doesn't really matter. These are fairly tame in terms of flavor, so there's no worrying about whether or not your kids will eat them, however if you'd like something a little more adventurous check out the Pimp Your Croquettes notes at the bottom of this post. One final note, these are an absolute show stopper at a party, so if you're making nibbles for game day, tailgating, a cocktail party or looking for bite sized superstars to serve during the holidays this year, you can't go wrong with this recipe, especially since you can prepare a lot of it ahead and simply fry them just before serving. 1. 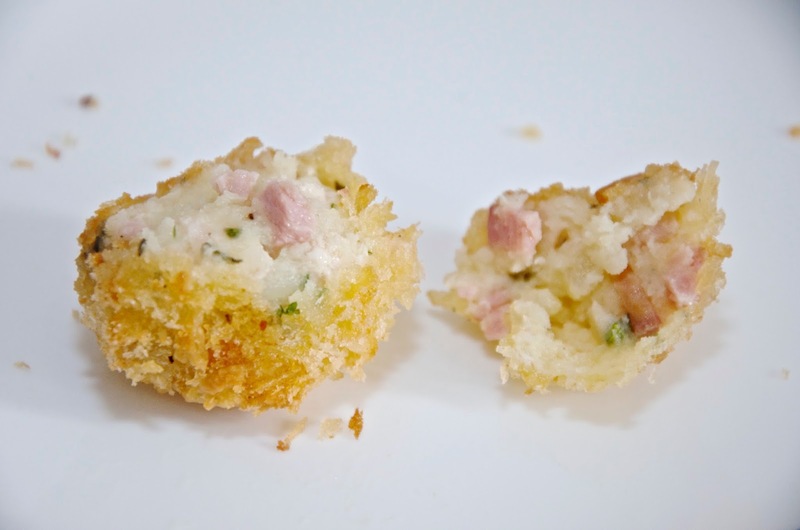 In a large bowl, mix together the potatoes, chicken, ham, herbs and one egg with your hands. Season with salt & pepper and then shape the mixture into small balls about size of a ping pong ball. If you find they're too warm, it may help to refrigerate the mixture for a half hour before rolling it into balls. 2. Add the milk to the second egg in a shallow dish or bowl and add the panko bread crumbs to another. 3. Prepare a baking sheet by covering it with cling film or grease proof paper. Dip a ball in the egg mixture making sure to let the excess drip off and then roll it in the panko crumbs until it's completely coated. Place the ball on the prepared baking sheet and repeat this process until all of the croquettes are coated. 4. Add enough oil to have about a cm in the bottom of a large skillet and heat it on medium or medium high heat. 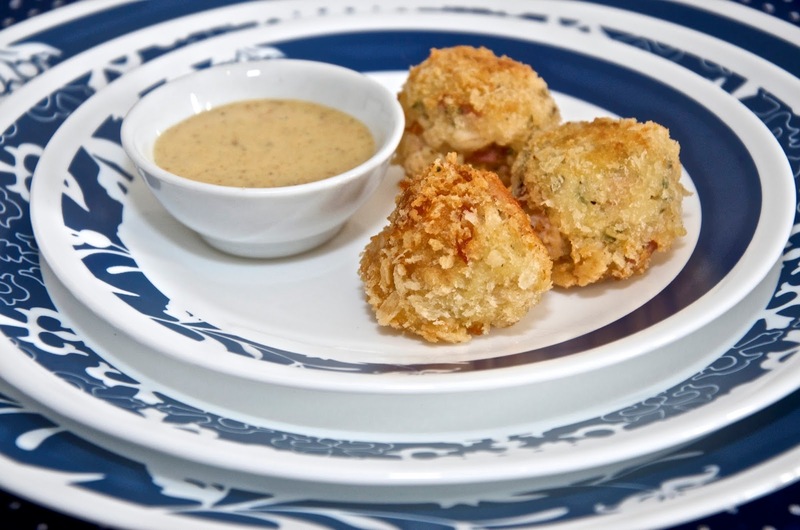 When the oil is hot, cook the croquettes until golden brown - you may need to do this in batches. Serve hot. 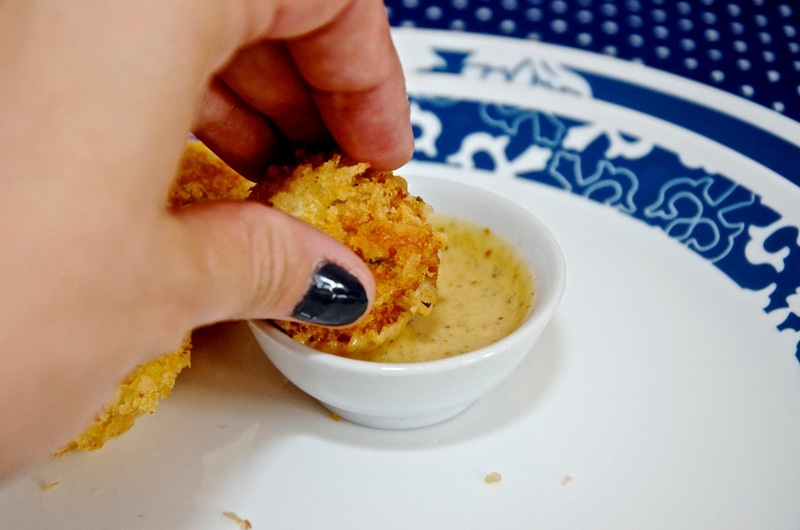 These little croquettes are delicious on their own, but they go especially well with a Spicy Honey Mustard Dipping Sauce. Click here for the recipe. 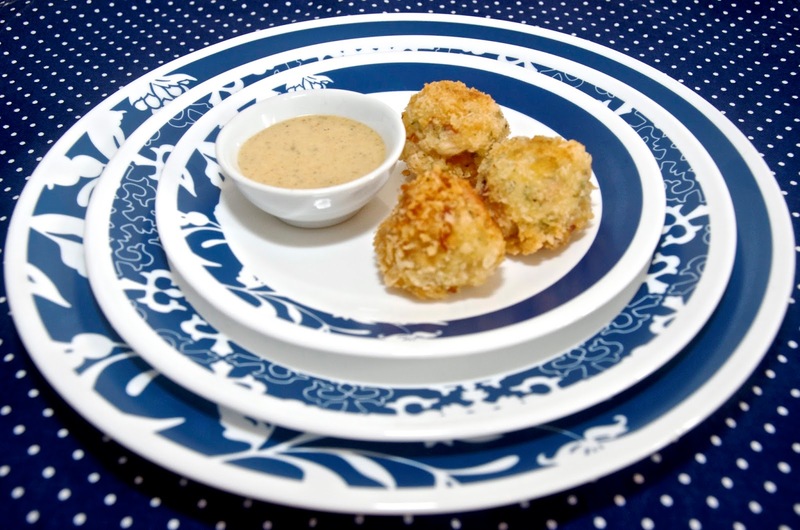 If you're preparing these croquettes in advance, make the mashed potato and croquette balls as early as the night before and store them in the refrigerator. Remove from the fridge 1 hour before coating. 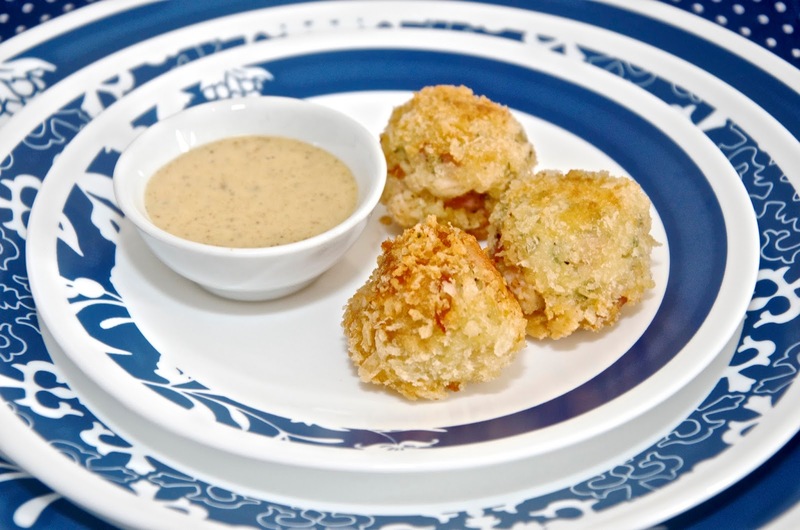 Coat the croquettes in up to 2 hours advance of frying and leave them on the baking sheet at room temperature or preferably in a cool spot, such as near an open window. You can make the sauce up to 2 days in advance. For more information on the Corelle dishes featured in this post or to buy, visit worldkitchen.co.uk. For more information or buy the Butlers Miniature Dip Bowl, visit butlers.com.